It is a real delight to join you at the Hunan-UK Future Innovation Summit. On behalf of the Chinese Embassy in the UK, let me begin by extending a warm welcome to Governor Xu and his delegation! Innovation is the soul of a nation's progress. It is the force behind the growth of state-to-state relations. It is timely that today's Summit focuses on innovation. At the just concluded sessions of the National People's Congress of China and the National Committee of the Chinese People's Political Consultative Conference, the Report on the Work of the Government 2019 was adopted. In the basic plans and main tasks outlined in the Report, innovation is one of the priorities. and by encouraging private sector startups and innovation. This year marks the 65th anniversary of the establishment of China-UK diplomatic relationship at the level of chargé d'affaires. The most prominent characteristic of China-UK relations over the past 65 years has been our innovative and pioneering spirit. What better way to celebrate this anniversary than with a Summit that focuses on future innovation – a Summit that brings together the best minds of all areas from both our two countries to explore the opportunities for future cooperation. Hunan Province and the UK are similar in size and population. Like the British, the people of Hunan are known for their pioneering and innovative spirit. There is great potential for the two sides to engage in cooperation on innovation. First, both Hunan and the UK are cradles of great people with a pioneering spirit. "When the provinces of Hunan and Hubei have a bumper harvest, there would be enough food for the whole country." And "There is no other place which boasts so many talented people like the State of Chu - an ancient name for Hunan. And Zeng Guofan, the pioneer of China's modern society. Hunan is also the place where Yuan Longping, the "father of hybrid rice", conducted most of his research work. Governor Xu himself is an outstanding representative of such a pioneering spirit. And he has been an Academician of the International Academy of Astronautics. The UK, as the cradle of the Industrial Revolution, has a profound tradition of science and technology and a unique culture of innovation. It is the birthplace of numerous world-famous scientists and great thinkers, such as James Watt, Isaac Newton, James Joule, Charles Darwin, Adam Smith and Bertrand Russell. These pioneers have had extensive and profound influence on the world. Second, both Hunan and the UK have taken the lead in innovation. and the world's most powerful six-axle electric locomotive. The British Government attaches great importance to science and innovation, and puts them at the core of its planning for long-term economic growth. According to statistics, Britain has taken the lead among developed countries in the number of research results by universities and institutions. It ranks the third in the Global Innovation Index 2018 Report released by the World Intellectual Property Organisation. And its strength in innovation was further displayed to the world at the British Pavilion, which themed on "Innovation is GREAT", at the first China International Import Expo held in Shanghai last November. Third, both Hunan and the UK are good partners for cooperation. The two sides have engaged in extensive and in-depth cooperation in such areas as economy, trade, science and technology. In 2018, trade between Hunan and the UK reached $680 million. By the end of 2018, Hunan was home to $220 million paid-in investment and $130 million contract investment from the UK. I am pleased to see that a growing number of companies from Hunan are exploring opportunities to carry out more cooperation with the UK on science, technology and innovation. CRRC Zhuzhou Institute has established R&D centres for semiconductor and electric drive technology in the UK. Xiangtan Electric Manufacturing Corporation is working with Garrad Hassan and Partners Ltd. on the development of above-2 Mega-Watt Direct Drive Turbines for Low-speed Wind. Looking forward, I am full of expectations for China-UK and Hunan-UK cooperation on innovation. May I share with you three suggestions for further cooperation. First, make overall planning and match development strategies. At the end of 2017, China and the UK signed the Joint Strategy for Science, Technology and Innovation Cooperation. This serves as a blueprint for our two countries to deepen cooperation on innovation. With the guidance of this blueprint, our two countries can tap into the synergy between our national development strategies, such as China's innovation-driven development strategy and "Made in China 2025" and the UK's Industrial Strategy and its innovation and research strategy for growth. This will enable us to enhance top-level design for our cooperation on innovation. Second, explore new ways and deepen industrial cooperation. To achieve the goals of its industrial development strategy, the UK is promoting innovation and international cooperation in areas such as artificial intelligence, health care, elderly care, green growth and cultural and creative industries. Hunan has a sound industrial basis and complete industrial categories, eleven of which are valued at 10 million RMB yuan. Traditional industries such as engineering machinery and rail transport are making steady progress. At the same time, emerging industries such as cultural and creative industries, telecommunications, e-commerce and service outsourcing are also growing rapidly. Hunan and the UK can work together to identify priority areas and key projects for cooperation according to each side's development need and industrial advantages. Possible areas for further cooperation include green manufacturing, environmental protection, medical information services, high-end equipment manufacturing and higher education. Third, enhance people-to-people exchanges and sub-national cooperation. The fundamental driving force for China-UK cooperation on innovation is in our provinces and among our people. Last October, Hunan Province and Lincolnshire established sister relationship. This creates opportunities for the two sides to share experience and explore cooperation on urban development, upgrading, regeneration and sustainable urbanization with a view to building green, smart and inclusive cities for the future. 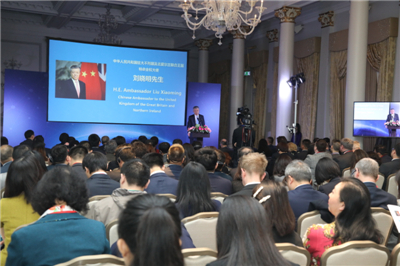 I encourage Hunan to enhance communication and cooperation with other regions in the UK as well to enhance connectivity and inter-connected development. Zhou Dunyi, a Chinese philosopher who lived in Hunan a thousand years ago, said that knowing the trend of the times leads to success. In today's world, innovation is the way to development, and cooperation can lead to win-win results. This is the irreversible trend. I am confident that as long as China and the UK continue to forge ahead and work together on innovation, we can deliver more tangible benefits to our people, and embrace a brighter future for the China-UK "Golden Era"! 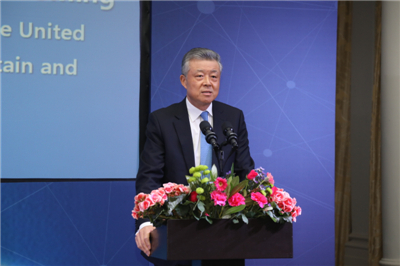 In conclusion, I would like to wish the Hunan-UK Future Innovation Summit a great success!